One of the things I struggle with the most is getting my students to speak Spanish outside of class because of course- how do I know that they did? A few years ago a colleague of mine introduced me to http://www.lingtlanguage.com. This site has totally transformed the way I do homework and I have seen a great improvement in my students’ speaking abilities. 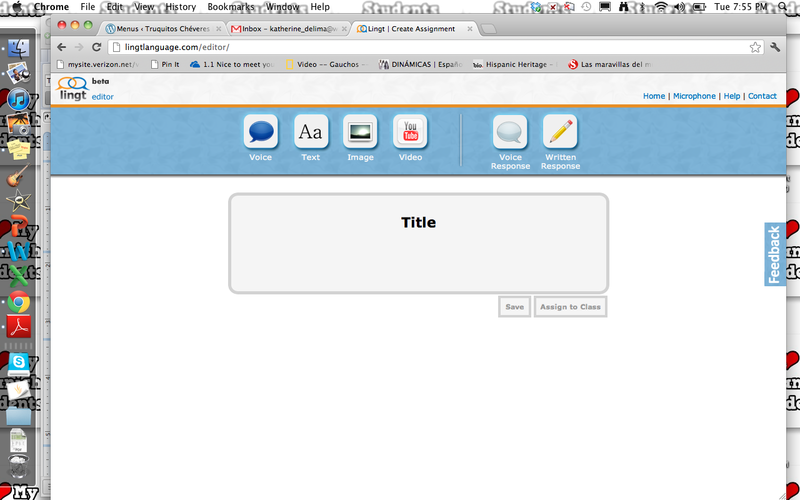 This site allows you to upload pictures and video, record and you can have the students listen, record, read and write. You can create prompts for them to listen and respond to, cloze activities and much more. I even love using this site for when I’m out and they can’t get a Spanish substitute because it is the best next thing to a Spanish teacher! The students love this site as well because they can practice and listen to their recordings and re-record if they want to. I usually record myself for the listening prompts but when available I have other native speakers record themselves for an activity and the students get exposed to a variety of accents. This of course is not perfectly authentic but I think it’s better than the book listening activities and sometimes you just can’t find appropriate or enough authentic listening activities. How do you get your students to speak the target language outside of class? ← ¡Hablando a toda velocidad!